If you've been in the warehousing industry long enough, you know it's only a matter of time before a forklift backs into a pallet rack. Instead of waiting to clean up a big mess, be proactive and install McCue's rack protection solutions. Ensure that your operations run smoothly and securely—even during peak hours. Get a quote today. Warehouse owners and managers know that rack protection doesn't just safeguard your property. You're also protecting your employees from hazardous mistakes. When heavy machinery is used around your inventory, you have little margin for error. That's why McCue's solutions are engineered to stand up to common bumps, impacts and collisions. We offer three types of rack protection products to ensure a safe environment for all. The Rack Mounted Guard provides heavy-duty protection that installs easily around a variety of rack sizes. These guards are made from polyethylene and meet the impact requirements as outlined in the BS EN 15512 standards. It's high-visibility yellow exterior is hard to miss, too. The Shock-Absorbing Rack Guard is uniquely designed to protect columns of pallet racks. It's reinforced with a rubber core to help deflect impacts from forklifts and pallet jacks. These guards fit around standard pallet rack 3"x 1" and 3"x 3" columns, and come with a zinc electroplated finish to prevent corrosion. With the Rack End Protector, nothing will come crashing into your pallet racking and cause it to come tumbling down. With 10" steel anchors fastening 55 pounds of flexible steel to your floor, this protection system isn't going anywhere. It sends glancing blows on their way and takes the brunt of direct hits. And like the Rack Mounted Guard, it stands out. Let's face it. 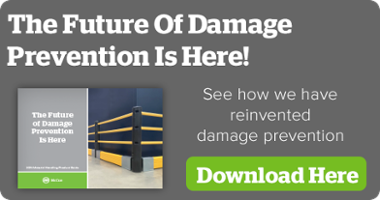 One avoidable accident can cause an entire pallet's worth of problems. Stop avoidable accidents before they start by installing McCue's rack protection products. Request a quote to get started today!